Erica Bauermeister is the author of the national bestseller The School of Essential Ingredients and Joy for Beginners. She lives in Seattle with her family. At the beginning of the book, there is a quote by Aesop: “Every truth has two sides.” What do you think is the importance of that quote to the novel as a whole? At first glance, Al appears to be a staid accountant, comfortable with numbers and order, never doing anything unexpected. And yet, he engages in a secretive and odd behavior: masquerading as a published author at nearby bookstores. Why does he do this? Did you find this strange or understandable? Consider the relationships between Isabelle, her children Abby and Rory, and her grandson, Rory. How do their familial ties differ from relationships that are based on friendship or love, such as Isabelle’s bond with Chloe or Lillian? In her family, Abby is regarded as the responsible one, a wet blanket who focuses on obligations instead of fun. Is this characterization fair? How does Abby see herself? What stereotypes or roles have been assigned to you that aren’t entirely accurate? Chloe and Finnegan’s relationship is rife with false starts, progress forward, and then backward slides. What about their individual personalities prevents them from connecting at first? Each chapter takes you deep into the perspective of a different character. How did this structure influence your views of the characters? Did your feelings about any of the protagonists change when you entered his or her point of view? Think about the various rituals that take place in the novel—for instance, Chloe’s walk with the empty suitcase, or Isabelle’s birthday celebration. What is the importance of these rituals? What rituals do you practice in your own life, and what meaning do they hold for you? What role do Finnegan’s blue notebooks play in his life?What do you think it means to him when he hands Isabelle her book to keep? Tom’s character is struggling with a great loss, and his lingering sadness in many ways impedes his new relationship with Lillian. How did you feel about his emotional journey? What allowed him finally to move on? In the novel, as in real life, a deeper issue often underlies a superficial conflict. What do lightbulbs mean to Louise?And to Al? 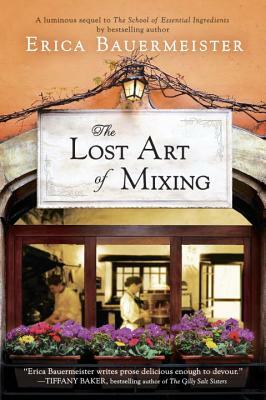 The author has referred to The Lost Art of Mixing as a series of dominoes, each character tipping another (or others) forward, often unknowingly.How does Louise and Abby’s near miss at the intersection factor into the lives of the other characters?What might this say about life in general? Which was your favorite character in the book, and why? Who did you relate to the most?